When changing the font style, you will be changing the style all across your website. Select the kind of text you want to change: Site Title, Headers (H1, H2, H3, H4), Paragraph, Navigation, Buttons, Feature Title, and Feature Text. 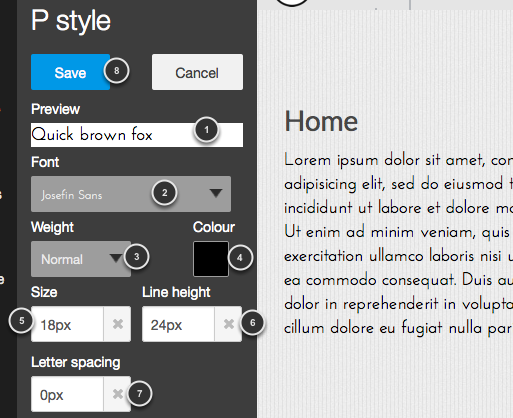 You can preview how your font will look on your site. Select a font from over 80 fonts in the drop down menu. Choose between a normal weight, bold or light. The line height will help to set the distance between lines.